Thank you so much! I know for some it must seem like such a minor thing, but being able to optimize my keymap is so important to me! Omg I hope you’re doing it for inset and loopcut aswell! I told you guys, they will fix it if it is inconsistent. Imagine you tried to report such thing to Autodesk or Adobe headquarters. Haha yeah. Adobe have been changing default keymaps that no-one asked for, and Autodesk would buy another developer to make the change. and Autodesk would buy another developer to make the change. Or hire another marketing person to come up with reasonable unreasons to not do it. Hi guys - modo user here and just wanted to ask some questions about ways modo and Blender compare. I’m a concept artist. I have used modo/3d extensively but it depends on the project. I’m definitely not a full-fledged 3d artist, so keep that in mind. mesh paint and the tack tool, one of my favorites! soft-drag and push tools, I use them all the time for large soft edits. Any thoughts on how they compare here? Does anyone miss any specific modeling tools from modo? Are most things doable in Blender, just maybe a little different? *I’m not trying to say Blender doesn’t have these or their equivalents. Maybe Blender has these and more - I’m just not sure where to find them? Another question about poly-modeling in Blender: Are most actions meant to be done using the r-click menus, or the “vertex,” “edge,” and “face” specific menus? I guess what I’m wondering is, is a lot of Blenders usability in those menus? I get thrown off about where the important tools are because the default toolbar and those menus are different. Selections: in Modo you can select-through, or select facing by simply using l/r/m-clicks. It’s awesome and I have no idea how people live without it I’ve seen a new add-on that emulates this, but don’t know how well it works. Do people in Blender just switch to x-ray when necessary? When people talk about “getting used to Blender,” is a lot of that about embracing the “axis” shortcuts, and maybe using Blender’s modifier stack? Anything else about Blenders fundamental logic that’s different? Left-click/tool activation: I am SO confused about Blenders modality for selecting and activating/releasing tools. Move tool, and a grab tool? I’ve messed with Blender some, and even tried some people’s custom keymaps. It seems like this basic things change with every custom keymap, and Blenders defaults feel alien (again, is this an issue of getting used to it?). I use Maya navigation and left-click. I know the industry-standard is coming, if I switch to Blender maybe it would be wise to wait for that and further customize it? Modo does one thing that I haven’t seen a lot in other apps: editing multiple objects. And I don’t just mean editing geometry (which is now in 2.8 correct?). As you modo folks know, you can select multiple items and change any attribute that they share, at once. It’s awesome. How does Blender fare in this regard? Custom setups: Obviously a lot of Blender users have custom setups (especially using all the add-ons). To be fair, modo’s form editor took some getting used to. But when I open Blenders, it’s so confusing (with things like 10 entries all named the same thing). Is this just a matter of getting used to how it works? Another customization point is pie-menus. Are they native to 2.8 now? Why is there an add-on for editing them? Is that still necessary in 2.8? That’s all I have for now, lol. Thanks for reading and any thoughts you might have! For a concept artist, Blender has quite a bit more appeal than Modo in my honest opinion. 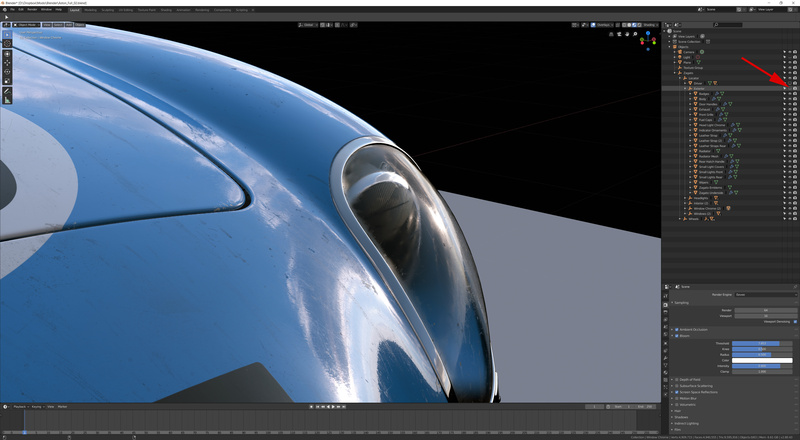 Eevee is way ahead of what Modo has done with their “advanced viewport”, Cycles, as well as lighting in general is quick and requires less set up to get results. More importantly, you have access to the grease pencil, which lets you draw in the viewport itself along with the 3D assets. Toss in compositing nodes and you can spend far more time in one application. Modo is a better modeler as far as it being a more direct out of the box experience. For Blender, once you toss in addons like boxcutter, Qblocker, mechmachine/decalmachine, hardops… ect and you customize the experience a bit to your liking, I believe the general modeling experience will be much better. The modifier stack is a lot easier to work with than Modo’s procedural modeling approach, which is absolutely awful imo. There are certainly parts of Modo that you can miss (bevel for example), and it approaches basic modeling in an effective and simplistic manner. Some of which are still present in Blender, though often presented in a different manner. For example you can move a selection, and slow down the speed of that movement (for more precise movements) by holding down a hotkey. Modo’s selections are still superior in so much as you can get what you need with less work, especially for more complex selections. I wouldnt be surprised though if Blender catches up in that area further down the line, perhaps with an addon or internal. Keep in mind Blender 2.80 is still in development, part of switching to Blender is the understanding that its going to continue along the development path, addressing some of the areas we find lacking. Unfortunately I don’t have much faith in Modo’s direction these days, development is slow but often targets areas that not everyone cares about and unless you are on a certain secret forum, you won’t have any idea what they are working on or how to give feedback on it. Blender is the opposite in that regard. The tools you mention (Loop Cut, Edge Crease, painting, and ‘tack’ (snap to surface normal) are all available in Blender. Sometimes they may work slightly differently. As for actions: Yes, you can do modeling using the right-click menu. It is context sensitive based on vertex, edge or face select mode. Obviously over time you may also learn and use the shortcuts inside those menus. The toolbar on the left are active tools - they stay active. Selecting through: Yes, X-Ray is meant for that. You can use the Z-key pie menu to activate it quickly. Left-click/tool activation: Whenever you click and drag in the viewport, it activates the tool enabled in the toolbar. Ie Select, Move, Scale or whatever it may be. Editing multiple objects: In Blender you can bring multiple objects into Edit Mode. You can also transfer values from one item to another, although this is more hidden in Blender. I hope we can make it easier! For now you can hold the Alt key when clicking on a value to change it, and it will then apply to all selected items. You can also right-click on a value or setting and pick Copy to Selected. Again, this should be simpler/easier - we are aware of it. Classic : Nothing impressive here, your classic vertex pushing tools, subdivisions surfaces, ngons, extrude, rotate, scale, grab/translate , proportionate editing etc. Sculpting : Do not throw your copy of ZBrush to the trash bin just yet but the sculpting tools of Blender should help you get there when it comes to organic modeling. Together with retopology tools you can use sculpting for mechanical modeling too. Nurbs : Fan favorite for car modelers and should not come as surprise NURBS were afterall designed by the car industry to allow for infinite detail and no worries about polycounts. Not that frequently used. Dynamic skin : Inspired by ZBrush’s ZSphere , this modifier may compared to Shrinkwrap act like a metaball but what it lacks in power and flexibility it makes it for ease of use. Texture : If you are coming from terrain generation modeling you are already pretty familiar with using textures to shape surfaces, together with normal maps and bump maps you can achieve super complex looking geometry subdividing a simple cube and not burning your CPU in the process. Material : Displacement output property can be used for volumetrics but again you can use it in so many different ways to achieve weird looking models. Grease pencil : Do not let the word in its name fool you, this pencil is not just for 2D , although it gets a lot of exposure for its elegant yet powerful 2D animation drawing and animatable capabilities, you only need an addon like BSurfaces to turns this to a powerful 3d surface generation tool. It can be used also for quick retopology. Morphs : Shape keys are used mostly for animation but they can act also as a great way to morph two diffirent meshes to a hybrid. This nifty tool also acts as an excellent history snapshot tool, allowing you to use the animation timeline to save your progress while modeling and go back in time to fix past mistakes. Array : It goes without saying that when it comes to symetrical shapes models nothing will get you there faster than the Array modifier. Do not make the mistake to glance through it, there is much more than meets the eye here, its capable of creating the most complex geometry imaginable , enough to make you forget about the traditional ways of modeling. Mod deform : Technicallly this is a family of modifiers where Shrink Wrap belongs but they are not that popular. Nonetheless because there many types of them and because of the ability of modifiers to combine well with each other you can use them to shape meshes or to use other meshes to shape meshes. Vertex colors : together with Vertext groups they can act as mask for deformation or even form the basic of myriads of effects and techniques , again we can write books about what these can achieve and how. Fortunately many tutorials exist online for these bad girls too. Povray : If the scriping capabilities of OSL are too weak for your taste well, what’s better than a scripting language designed for defining everything 3D ? Povray is a Blender by itself and yes Blender offers native support for it. Python : Few would have guessed that this kids like , simplistic , yet slow scripting language would in the time span of 10 years take the world by storm and enter the VIP of the 3 most popular programming languages out there. We may call them scripts but make no mistake about this Blender was one of the first to support Python outside the box and the API has very deep access to Blender internals. If you looking for the language powerful enough to drive the latest technology on AI, look no further, there is no limits to Blender Python’s capabilities and with its myriad of libraries and amazing support, its not wonder 90 % of Blender capabilities are addons. Addons are the bottom of the iceberg, we can talk for centuries about each one of them and still scratch only the surface. Addon’s contrib repository, the official third party repository of Blender for addons comes included with around 100 addons but hundrends more can be found in their wild state at their natural habitat. Do not get close though, they have a nasty bite ! Most of free ones can be found on GitHub, commercial ones can be found on Gumroad and Blender Market. I haven’t tested this setup exactly, but it should work. As far as keymaps go, I highly recommend going in and taking a look at what everything is. There’s a lot to customize, and especially when you get more add-ons, you’ll want to be familiar to best customize to your needs. But it’s important to know that there is a hierarchy. 3D View will override Object and Mesh. This is a good thread to look through, rawalanche is doing a great job, and is taking the time to explain their reasoning as well. The context menus are nice, but there are some tools that work in all three modes, but will only show up in one menu. You could add them to the Quick menu, but I personally made my own menus with Pie Menu Editor. Pie menus in Blender are great! Much more can be done with them here than in Modo. Hey guys - whoa, thank you so much for all the information and thoughts. You’ve all helped verify some readings I’ve gotten from Blender, which is really helpful in that it somewhat verifies that I’m not “reading” Blender wrong. @Saintheaven - thanks for your take on concepting with Blender. I’ve seen some of those videos and even played around with grease pencil a bit. I can image a LOT of uses for it, such as sketching directly ON to a piece of blockout geometry in order to iterate/share ideas. I’ll say it takes a little getting used to. I understand 2.8 is still in development, and that’s pretty exciting. I have no idea what’s coming for modo either, and I agree it’s been hard to pin down what Foundry’s priorities are with it. I have to be honest, I’m afraid of missing too many things if I switch over - ultimately it’s an exchange, and what would I miss for what I would gain, right? Thanks again! @ William - thanks for responding! Your simple explanation of the tools in the menu being “active” helped a lot, actually. And I would definitely be making pie menus for favorite commands, but the keymap editor is even more confusing than modo’s (or maybe not?). So eventually I wouldn’t worry about where they can be found natively. It’s just a matter of tracking down what things are called, and where to either change it’s shortcut, or find it’s command for a pie menu. I have to say, I’m not crazy about x-ray mode, but it looks like there are solutions out there. As for editing multiple objects, it’s great to know that it’s on the devs radar, I have to say that’s a big one. @ kilon - you’ve gone above and beyond here with your breakdown. So thanks. I did know some of this already. But I did NOT know curve modeling is that big a part of modeling in Blender. Very good to know! I’m also very curious about the shrinkwrap modifier, since it looks like a real helper achieving certain modeling tricks - and it can’t be found in other packages the way it works in Blender…? @ Zimlorog - Thank you!! This is a huge help for me getting used to Blender! I’m going to set it up and see what it’s like working with it. It’s been hard to try things when the most simple actions are “strange” to me. Also, 3d View over Object and Mesh is a great tip. I’m already more equipped to play with custom inputs. And I’m with you - favorite commands go in pie menus! Can’t wait to try this stuff out… thanks again. Objects aren’t merged and it’s not metaball like. It’s limited mesh deformation and custom normals. Is there a way to hide all the children of an object? Many of my projects from Modo are parented to locators (empties) as a way of arranging the hierarchy. In Modo this makes it easy to toggle subsets of the model very quickly. In Blender hiding the empty only hides the parent and leaves the child objects unaffected. That’s more of a workaround than a solution but I guess I’ll get used to it. When you import FBX files from other software for models bought via turbosquid etc they are often arranged like this. Having to add stuff to collections is an extra step. So there is no way to hide all child objects in Blender? People are requesting this all the time. But no luck unfortunately. At this point I don’t even know what to think. To me they are over complicating everything related with the outliner visibility, which is something that should be simple and straightforward. It’s truly a mess.